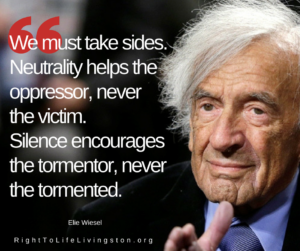 Right to Life Livingston – Peacefully protecting humans. All of them. 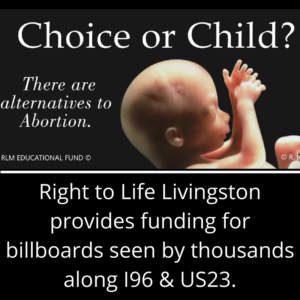 What is Right to Life Livingston? 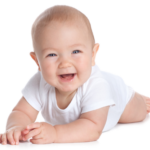 Right to Life-Livingston County Inc. is an affiliate of Right to Life of Michigan. 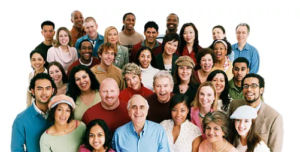 We are a nonpartisan, nonsectarian, nonprofit organization of diverse and caring people united to peacefully protect the precious gift of human life from fertilization to natural death. We strive to achieve the passage and ratification of a Human Life Amendment, to educate people on identified Right to Life issues, to motivate them into action, to encourage community support for and participation in programs and legislation that foster respect for human life and to promote prolife candidates.